RBNY vs Union : We Won! 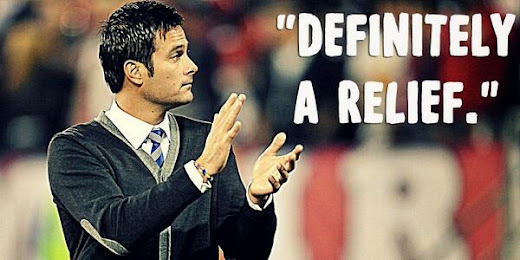 Mr. Petke On a Long Term! After another lackluster fist half, the Red Bulls roared back and handed the #DOOP boys a 2-1 loss @The Cathedral of Football. A much needed victory for our boys, with Thierry Henry and Lloyd Sam finding the back of the net. Philadelphia pulled one back late, through a penalty (committed by Sekagya - who saw Red on the play), and it was a very nervy 17 (or so) final minutes. But the Taurine Boys held on, the proverbial Monkey is off their backs, and it's "Franchise In Crisis" no longer. Fantastic performances by Eric Alexander, Roy Miller, Thierry Henry and Mr. Lloyd Sam. Also, Tim Cahill made his return from injury as a late sub. Once again, Luis Robles came up big for us. Kept us from going down 1-0 in the first half and was very unlucky to not have saved that poorly taken Sebastien LeToux penalty. Our first win mates! The season starts now! Git In Lads! Drunken comments and predictions top, highlights above. Hope to see you all next Wednesday @The Cathedral of Football, Red Bull Arena (built by Makita). The big viper is outtahere!